Review of the Guidecraft See and Store Dress Up Center - Is This The Best Unit? Is the Guidecraft See and Store Dress Up Center the best option for your kids dress up storage needs? According to Amazon stats, it’s the most popular one on the market. But, does that mean it’s the best? Keep reading for the full review of this product! 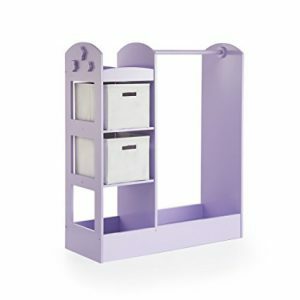 The Guidecraft See and Store Dress Up Center is a piece of kids furniture for play rooms or bedrooms. It is intended for easy and attractive storage and organization of dress up clothes and accessories. While it’s target audience is girls, boys too can easily use this product. 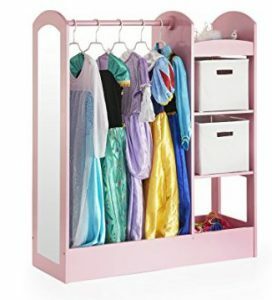 This dress up storage unit has a section for hanging princess gowns or other costumes (superhero costumes, career dress up, etc), 3 storage shelves for toys and dramatic play accessories, a spacious and deep-sided bottom tray and a full-length acrylic mirror. It certainly does look like it would do the trick and organize everything nicely, doesn’t it? Let’s take a look. First, an overview, then we’ll delve deeper. Instructions for Assembly: Simple, step-by-step pictoral instructions included. it fits costumes sized 6-8 just fine. The bottom tray is deep and perfect for wings, swords, boots and the like. Age Recommendation: Reviewers have purchased this for younger than 3 year olds, but as a Mom of two littles, I’d be assuming the parents then do all of the hanging up of the costumes (my 2/3 year olds would not be able to hang up their costumes by themselves yet). Mirror: The full-length mirror is shatter-proof and acrylic (not a “real mirror”). Reviewers on various sites that I dug through for information state that it is a very decent mirror, much better than expected, not a “fun-house mirror”. The mirror can be hung on the right or left side – the pieces are interchangeable. Product Materials: All except the Natural color is made of MDF. It’s easy to clean, resists stains and scratches. It is NOT solid wood, but rather MDF. The dowel is however, made of sturdy wood. The Natural color is constructed of Birch wood and has a child-safe polyurethane finish on it. So, IS it the Best Kids Dress Up Unit? Overall, this is a very good option for your child’s dress up storage needs. It is my personal top choice. In general: The Guidecraft See and Store Dress Up Center is a very cute, child-sized, well-constructed piece of kids furniture that is perfect for the home or nursery-school or pre-school. If you don’t mind dresses and costumes touching up against each other, it can hold a lot of costumes and gear on the dowel, in the bottom tray, and on the side shelves. Kids can put away their own dress up clothes – and then FIND what they want to wear, very easily, as everything is nicely in view. No hidden compartments… it’s all visible. The footprint isn’t huge. It is a decent sized unit, but won’t take over a room. It is solid and well-constructed – sturdy so you won’t have to worry about it falling over. Several reviewers of this product (I saw about 10 or so who mentioned this in all of the reviews I read through on Amazon, Wayfair, Toys R’Us, and more) mention a chemical-like smell on the product once they unpackage it. Most call it a “paint” smell, one wrote “formaldehyde”. It does wear off after several days, they write, but it isn’t the most pleasant. Won’t hold a HUGE amount of dresses or costumes on the dowel – especially if you don’t like to squish them in together. The dowel is slightly under 2 feet. For boys, there ARE little flowers that come with on the one side. They can come off (one reviewer claimed they came off “too easily” on her daughter’s unit, actually). Do You Want This Product – or More Information? 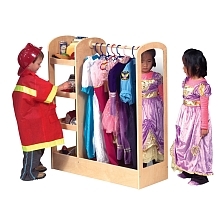 I’ve looked at multiple places online, and the best price you can find for the Guidecraft See and Store Dress Up Center is at Amazon.com. There, you’ll also find lots of reviews straight from people who have purchased it already. Thanks for taking the time to read through this review! I hope it was helpful for you! Feel free to drop me a comment or ask a question below! 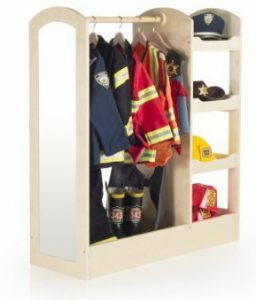 Top 12 Kids Dress Up Clothing Storage Units – Which One To Choose? Guidecraft Dress Up Carousel vs Kidkraft Swivel Vanity – Which Is Better? Easter Bunny Costume For Baby – 8 Super Cute Options! This is a very nice dress up storage unit for kids. Especially for little girls and their princess outfits. It comes in handy for all the kids who has tons of costumes. I have a niece who I think would love to have this as a gift. She is so adorable and I think she would like this. A must have! Thanks for the great info. Thanks Kendrick – I agree… kids would love this for their dress up clothes storage! Your niece would too, no doubt!